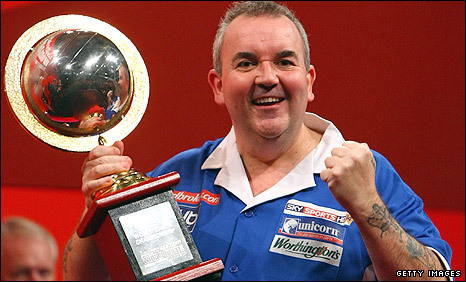 Phil Taylor secured his 15th world title after outclassing unseeded Australian Simon Whitlock 7-3 in a gripping PDC World Championship final. 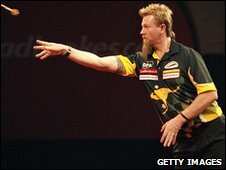 The 49-year-old was made to work hard after Whitlock secured a 2-1 lead with some fine early darts. But the defending champion fought back to take five sets in a row in a classy display, including a 170 checkout that Whitlock sportingly acknowledged. Whitlock bravely took the ninth set but Taylor powered back to claim the title. The Stoke player, who takes home £200,000, has now claimed an incredible 13 PDC world titles, in addition to the two BDO crowns he won in the early 1990s. Whitlock was ultimately well beaten but will surely be happy to have reached the final - and bag £100,000 in the process - after coming into the tournament as an 80-1 outsider. "It's everything I have ever dreamed of and practised for," Taylor said. "I think it is one of the greatest finals. It was hard and it's absolutely brilliant. I'm so chuffed. "It was like Nigel Benn and Chris Eubank, he kept hitting back and he never gave in. He kept saying to me in the breaks he wasn't going to give in and he didn't. It was an absolutely brilliant final." Taylor's victory, 20 years after his first world title, was certainly not as straightforward as his 7-1 demolition of Raymond Van Barneveld last year. Whitlock took the first leg of the match but "The Power" quickly found form, claiming the opening set 3-1 to the delight of the partisan crowd at Alexandra Palace. The Australian responded with a maximum 170 checkout at the start of the second and went on to win three legs against the throw to level things at 1-1. And Whitlock, who knocked out Van Barneveld in the semis, capitalised on some uncharacteristic mistakes from his opponent to take the third set with one dart at double 16 and move into a 2-1 lead. Taylor slowly began to show his class, moving 5-2 ahead courtesy of a some top-class darts, including a superb 167 checkout. The favourite was suddenly in top form and a brilliant 170 checkout in the eighth set saw "The Wizard" sportingly offer his hand in recognition. Whitlock did come back to claim the ninth after an error-strewn final leg, but there was no stopping Taylor who sealed the victory with an impressive 131 checkout. "I'm just proud of the way I played," said Whitlock. "I think I pushed Phil a bit and next year I'm going to come back stronger. I'd just like to thank all the supporters. "It's changed my whole life. I can move over here and can play on the circuit now. I hope this support continues for all of my life. I'll keep trying and will never give up in trying to become a world champion." Earlier Mark Webster claimed a cheque for £60,000 after winning the third-place play-off against Van Barneveld. Neither player managed to take an early grasp on a first-to-10-leg match that was played in something of a low-key atmosphere. But the Welshman moved 9-8 ahead late on and then broke Van Barneveld's throw to take third spot on his debut at the PDC event.